When times are hard, friends show up. Travel to Palestine now! You are here: Home / General / When times are hard, friends show up. Travel to Palestine now! The month of October and the first days of November have brought heightened tension and increasing harassment against Palestinians within occupied East Jerusalem, the West Bank, Gaza and Israel. Neighborhoods have been shut down and checkpoints have proliferated. Non-violent protests (although not covered by Western news media) have taken place. The question raised among many has become, “Is this the Third Intifada?” Everyone has an opinion. Of one reality there can be no debate: Palestinians continue with their lives. They do so with dignity, determination and faith. While it is not surprising that some tours have been cancelled, others have proceeded as planned and have found their journey to Palestine safe and even more meaningful than could have been predicted. Participants have met local people and community leaders. In this time of great need, visitors have provided much-needed encouragement and hope. The fact is that all travel to Palestine at this moment is solidarity travel. And as we all know from personal experience, WHEN TIMES ARE TOUGH, FRIENDS SHOW UP. I want to draw your attention to a special opportunity for solidarity travel that’s coming up in January. The traveling seminar Popular Resistance and Liberation Theology in Palestine, set for January 13-22, 2016, is co-sponsored by Kairos USA, Friends of Sabeel North America, and Sabeel Jerusalem and will focus on multiple forms of nonviolent resistance. Day trips will include visits to refugee camps, villages and cities. A day-long seminar with leading practitioners of popular resistance will be an integral feature of the experience. Another day will be spent in Ramallah, offering unique insight for current, up-to-the-minute realities of Palestine. Co-led by Michael Spath, Don Wagner and Linda Kateeb, this journey is intended for those who have visited Palestine before and choose to travel with like-minded activists. Participants will experience the lives of villagers, religious leaders, community activists and non-violent practitioners in today’s situation. Another journey worth special mention is the Footsteps of Jesus Alternative Tour planned for January 20 – February 9, 2016. Rev. Jeff and Janet Wright serve as co-leaders and hosts. 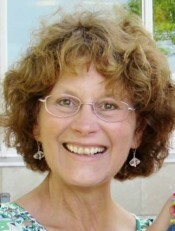 Janet has worked in Palestine as a mental health care provider and Jeff is a recently retired Disciples of Christ pastor, and a Long Term Volunteer Missionary through the Global Ministries Partnership of the Disciples of Christ and the United Church of Christ, working with Kairos Palestine. Together they have led tours to Palestine for years. This tour not only explores the holy stones – the historic places and sites that have defined the three monotheistic faiths – but also allows pilgrims to engage the “living stones:” Jews, Muslims and Christians living in the land. Participants meet with community peacemakers, church leaders and villagers. There are opportunities to engage with Muslim, Christian and Jewish leaders and discuss differing perspectives on the current political situation. Many additional, outstanding alternative travel opportunities exist. The list provided below is not inclusive of every trip on offer, but it gives a starting point for considering life-changing travel to Palestine. Wi’am Center and Tours in English (Green Olive Tours) can arrange day trips if you are in Israel/Palestine with limited time (and longer trips, too). Pilgrims of Ibillin “Living Stones” Pilgrimages. Meet with peacemakers in Bethlehem, Jerusalem, and Hebron, four days on the campus of the Mar Elias Educational Institutions as honored guests! This is a season for dedicated activists to return for a visit. This is a season to give the priceless gift of SHOWING UP. 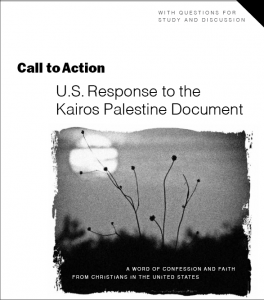 To read the Kairos USA Call to Action document (PDF), click here. To order printed copies with study questions for your organization or congregation, click here. To obtain study materials for the Call to Action document, click here. Kairos USA offers a comprehensive Call to Action study guide that is designed to accompany the Kairos USA Call to Action document. Click here to download the study. Help Kairos USA continue its work with a tax-deductible donation. Your donation will support development of study materials, maintenance of the website, continued outreach and education, and basic administrative costs. Kairos USA is a 501(c)(3) organization.